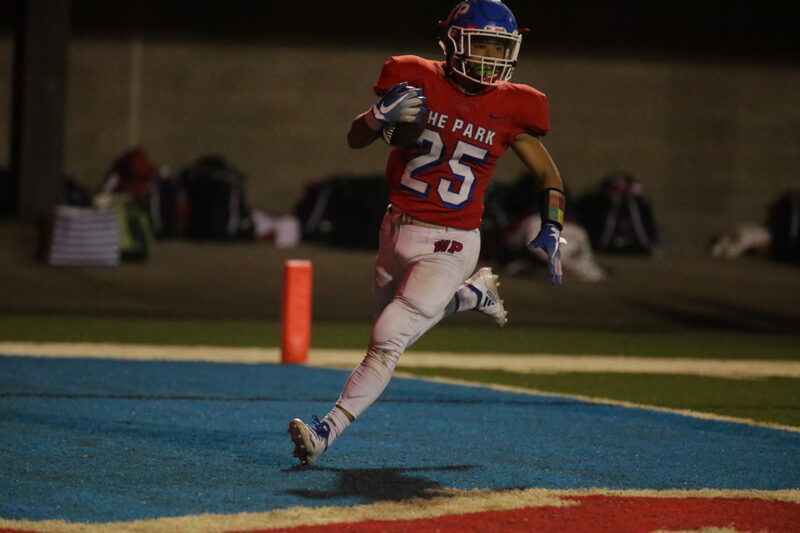 Photo by Alex Kozlowski Steven Mitchell and Wheeling Park will face Parkersburg for the second time this season. The Big Reds defeated the Patriots in a instant classic earlier in the year. WHEELING — Wheeling Park coach Chris Daugherty and his then-unbeaten Wheeling Park football team traveled to Wood County for a Week 6 battle with Parkersburg that has to rank among one of the best games played in West Virginia in 2018. Friday night at 7:30 p.m. at Wheeling Island Stadium the Patriots (7-3) and Big Reds (6-4) will do it all over again, this time in a battle of eight and nine seeds and a berth in the Class AAA state quarterfinals on the line. While thrilled that his team has the opportunity to play on, Parkersburg coach Mike Byus is not a fan of the current seeding system. “Everyone keeps telling me you have to play a tough schedule and that it is such an advantage to your team when you do,” Byus said. “I don’t see any benefit in it at all. We beat Parkersburg South, which gave Ripley its only loss, and we beat Wheeling Park, as did South, and we have to go on the road, be fortunate enough to beat Wheeling Park again and then go to Martinsburg next week if we do. “And all three of those teams (South, Ripley, Park) finished ahead of us. On that night on Sept. 28 Wheeling Park watched Parkersburg run out to a 31-7 lead early in the contest, only to battle back and take the lead with 51 seconds to play. However, the Patriots suffered their first loss of the season that night, watching the Big Reds hit a hook-and-lateral with under 10 seconds to play to post a thrilling 57-51 victory at Stadium Field. “We definitely need to play better defense than last time, but we also can’t turn the ball over five times and put that kind of pressure on the defense,” Daugherty said. “And I doubt very highly that either team will be able to match their offensive out-put in that game, even though it is a great match-up. Daugherty’s crew is coming off an impressive 35-7 victory over arch-rival, and fellow playoff participant, John Marshall last Friday night on the Island. Meanwhile, Byus’ squad also picked up a big rivalry game victory with a 28-10 triumph over Parkersburg South. Both teams have very capable play-makers, which they showed in their week six match up, and both can come at you either on the ground or through the air. Parkersburg has possibly one of the finest pitch-catch combos in the state in quarterback Jake Johnson and tight-end and Penn State recruit, Brenton Strange. Johnson has thrown for over 2,100 yards and 22 touchdowns while Strange has over 50 catches for 800-plus yards. That duo came up big the first time around with Johnson setting school records of 30 completions, 396 passing yards and five touchdowns. Strange, meanwhile, had nine grabs for 182 yards and two scores. Tailback Tyler Moler has rushed for over 1,300 yards and 12 touchdowns while Braeden Mason and Dylan Shaver, who scored the winning touchdown in the initial meeting, have combined for over 70 catches for close to 1,000 yards and 10 touchdowns. Defensively Strange has accumulated six sacks and three interceptions while Kionte Peacock has intercepted seven passes, including one to end the game a week ago. The Big Reds began the season 1-3 but have won five of their last six games, the only loss coming in overtime to Huntington, 27-21. “They probably play the toughest schedule in the state of West Virginia,” Daugherty said of Parkersburg. “Actually, I heard a news reporter make the comment that they have played the most playoff teams in the state, one more than we have. “I can guarantee you that the majority of teams in this state could not get the nine seed playing their schedule, so credit them. Wheeling Park has a first-year quarterback who has done an outstanding job directing the offense, what has turned into a three-headed monster at running back and a pair of the finest wide receivers in the Ohio Valley. Junior Alex Dunlevy has hit 102 of 161 passes for 1,480 yards, 25 touchdowns and seven interceptions. His favorite receivers are Jack Stakem who has 41 catches for 570 yards and nine touchdowns and Devaughn McWhorter (30-482-9). Stakem had a huge night last week with eight catches for 109 yards and a score. The running game is led by juniors Kenya Robinson and Rapheal Bradley while sophomore Stevie Mitchell has really come on late in the year and has been the team’s leading rusher the last two weeks. Mitchell carried 14 times for 117 yards and two scores against the Monarchs. On the season, Robnison has carried the ball 159 times for 929 yards and 13 scores while Bradley has 705 yards on 100 carries and has found the end zone four times. “This will be the third time we have met the last two seasons and the first two have been great games,” Byus said. “Both teams played in spurts earlier this year with them coming back from way down, then us rallying again and then both teams scoring in the final minute of play. While the defense has let the Patriots down in their three losses, the Park has outscored their opponents by an 87-27 margin in its last two wins. Daugherty’s club has scored at least 31 points in nine games this season with a stunning week 10 loss at Parkersburg South (30-0) the other. “I don’t know anyone that had us marked down for averaging more points a game this year than we did last,” Daugherty said. “We lost our starting quarterback to Toledo, two very good receivers and two talented running backs from last year. “Our offensive line has played under the radar all year and a lot of that comes down to the fact that the skill positions trump how people judge offenses. But that line has a lot to do with our success. “The other thing has been the play of Alex, who had to come in and take over for a great quarterback. We were optimistic he could do that, but he has been more than even we expected. He is currently sitting at 25 touchdowns passes, just two off of the school record, and no offense to Cross (Wilkinson), but he did that in 14 games and Alex is currently at just 10. The two teams have met 11 times overall with Parkersburg owning a 10-1 advantage in the series. Ironically, the Patriots’ only win against the Big Reds was in the first-round of the 1996 playoffs.